For the circulatory system, blood pressure, cholesterol, varicose veins and spider veins. Ingredients: green barley grass, fenugreek, alfalfa, ginkgo, butcher's broom, ginseng, Gotu Kola, horsetail fern, turmeric, capsicum, ginger and MSM. Tabletting ingredients: Dicalcium phosphate, PVP VA 64, magnesium stearate. 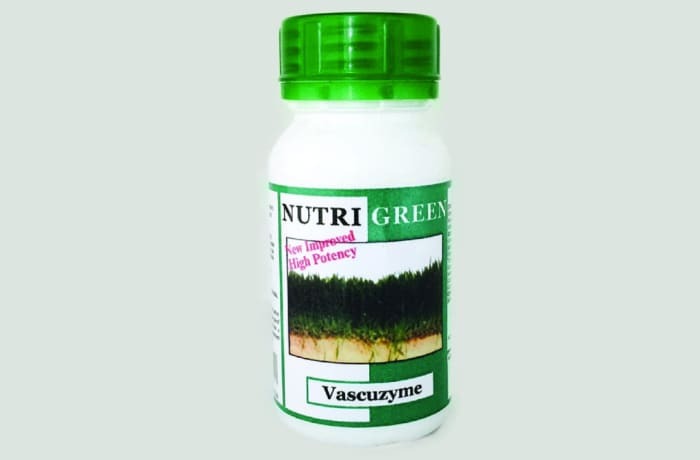 Vascuzyme is nutritionally beneficial for: Circulatory system Blood pressure Cholesterol Varicose veins Spider veins Dosage 1 tablet 3 times daily with water before meals or as required or as recommended by your health care professional. Free of Artificial preservatives, flavourings, colourants, added starch, sugar, lactose, gluten, wheat, yeast, salt, animal or dairy products. Suitable for: Vegetarians, Vegan, Kosher, Halal, Hindu & Diabetic diets. Other information Not a significant source of protein, carbohydrates, fats and cholesterol.